I'm getting ready to R&R the brakes on my 67 loboy. ordered brake bands x2, final drive gaskets x2 & return springs. The right side functions very good, I can spin the tractor on the right wheel. the left side not so much, the brake pedal rotates almost 90 deg. and will not return. The local Case-IH service manager seems to think the brake band broke, after i expressed my concern about the pivot and retaining pins. Replacement pins are not available from Case-IH, so the SM recommended if necessary to get some long shank grade 5 bolts and cut them to fit. based on what I've read here that may not sound like a good idea??? Try the Forum Sponsors at the bottom of this page or Post on THE VINE Classified Forum. TM Tractor sells the style of brake pin that has the collar on it. I measured one of those and several without the collar. All are 5/16" in diameter. After you disassemble, you'll know what you need to replace. Do you have any other cubs not so tactically important that you could do a temporary swap of final drives? That’s what I plan to do. My daily driver is a ‘77 and badly needs brake and seal work. I also have a non-running ‘51. My plan is to swap the final drives to give me a chance to pull apart, diagnose, order parts, and maybe even repaint the yellow ones. I imagine the brake style change occurred during that wide window between years. That may or may not be a problem hooking up the brakes, but I’m not really concerned about it since I do not have brakes now, either. I think that would be the only possible incompatibility, unless someone tells me differently. She’ll be a red and yellow particolor for a while, but no big deal. 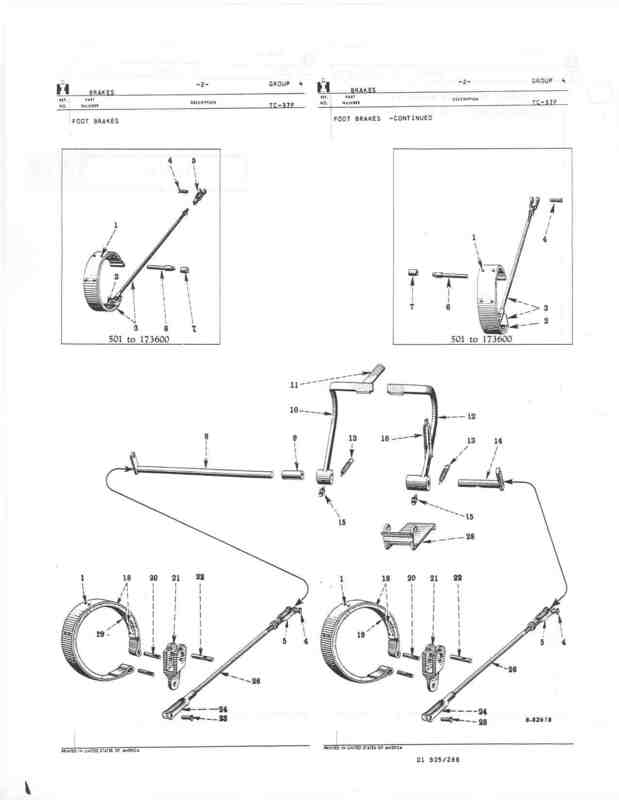 Below is a page from the Cub parts manual showing the brake bands and linkages. A LoBoy has the brakes in the bottom pics. Like Tim said above, it is a good idea to replace the seals on each side of the brake drums whenever you remove a final drive, if the seals haven't been replaced lately. If the seals leak, the brakes will get oil on them. There should be no oil where the brakes are. There is a seal in the transmission housing, and a seal in the final drive housing. 2 seals on the left side, 2 seals on the right side, so 4 seals total for the 2 brakes. The seals are 2 different sizes. 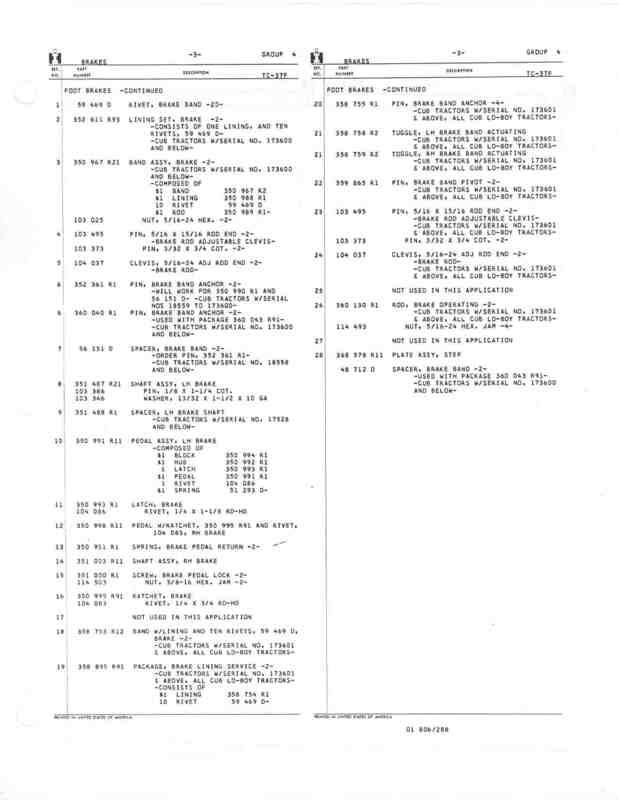 Below are listings at TM Tractor for them, you can look at them. This listing shows where the final drive seals go. The Cub and LoBoy service manual shows how to work on them, I would read it before working on it. It is better to remove 1 final drive at a time, and leave the wheel and tire on the other side, until you are done working on the 1 side. Below is a post by Dale Finch showing removing a final drive from a Cub. The LoBoy is similar. Below is a pic from TM Tractor of a LoBoy final drive, showing the oil seal. Remember to use front axle wedges when removing final drives. The 2nd pic shows them. Crimson Tim wrote: Do you have any other cubs not so tactically important that you could do a temporary swap of final drives? mikes5785 wrote: I'm getting ready to R&R the brakes on my 67 loboy. ordered brake bands x2, final drive gaskets x2 & return springs. TM has US made new ones for $9.52 ea. Be safe when pulling a final drive. Good Luck! mikes5785 wrote: I’m not really interested in doing that job 2x . . . This just isn't that big of a job. Get the parts you know you need and pull it apart. If you find you need some more parts and it snows before you get them, just put the final drive back on and plow the snow. It is only 6 bolts and one pin. You will deal with anything that is stuck or rusty on the first round. Second time will be easy. Got the pins from Urbish, thanks but didn’t need them. Better to have them and not need them, than the other.